A brief introduction to the Trapezoidal rule and a uniform interval Composite Trapezoidal Rule implementation. The Trapezoidal Composite Rule can be implemented directly from the iterative formula presented above. The first and the last ordinate would be calculated separately and the other ordinates would be summed by a loop and then is multiplied by 2. Next these two parts are added together to get the integral. For demonstration purpose some sample functions are used. int main (void) : The main function prompts the user to enter the upper and the lower limits and the number of intervals to be taken and calls the functions with the proper parameters. The trapezoidal() is called as Iz = trapezoidal (f1, a, b, n); which computes the integral of the function f1 within upper and lower limit a and b with the Trapezoidal Rule. Although the theory tells us there will always be a smallest safe value of M, in practice we can hardly ever find it. Instead, we find the best value we can and go on from there to estimate . To make small we make small. 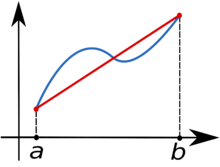 It also can be graphically seen that a line fits less accurately for a certain interval in a higher degree function than a lower degree function. So increasing the interval h will result in better results, or implementing better fitting curve than a line needs to be selected. ans = trapezoidal (parse_expression (user_expression, x), a, b, n) ; the ‘user_expression’ is being considered a single variable function with the variable replaced with the value of ‘x’ . I dont get it but, –it’s very cool that you do!